We didn’t ask for this war. Heck, we didn’t even see it coming. When the aliens attacked, humanity was caught off guard. We had been fighting our own battles for so long, we never expected the real threat to come from beyond the stars. Those first months after the initial barrage were hell. Everything was thrown into chaos, and those that survived were left scrambling to escape the major cities. That was then. We’ve regrouped, reassembled, and now we’re ready for revenge! Our forces are highly skilled, but also vastly outnumbered. We can’t launch an all-out assault on the aliens. Not yet anyway. We need to focus on smaller strategic strikes to chip away at them, and if we’re lucky, turn the tide in our favor. It’s not much of a chance, but it’s all we’ve got. Combat happens in a split second. You don’t have time to think out every move you’re going to make. You have to rely on your instincts. Moving fast, shooting without hesitation, killing as second nature, it can be the difference between life and death. In Project ELITE, you join the ranks of humanity’s last chance. You’ll work together in a series of different missions, with the hopes of reclaiming our home world. Each game you play can be set up in a different way and will have a different Objective. You may be sent out on a Capture or Recon mission where getting into the hot zone and getting out again is your top priority. But there are also Demolition and Extermination objectives that will force you to get your hands a bit dirty. Each game is played out over eight rounds. You’ll have either completed your goals by then, or the human race will have taken one big step towards extinction. At the start of a game, you’ll choose a Mission which tells you the type of Objective you’re trying to complete and you’ll select the difficulty level of the Mission. You can decide the experience you want to have, from an easy walk in the park to a white knuckle fight for survival. Each round is broken up into phases. The Event phase reveals new Event cards with a condition that may remain in effect until the card is resolved. Next, the Alien Spawning phase will introduce new extraterrestrial invaders to the board, including possibly Alien Bosses. During the Action phase, we get a chance to strike back. The Action phase is where the majority of the decisions are made during the game. The only catch is that you only have two minutes to get it done. Once the timer starts, players simultaneously roll their Action dice in real-time. Until the time runs out for the round, they are able to use their results to complete as many actions as possible, like moving around the map, searching for new Items or Weapons, completing Objectives, and of course, shooting aliens. However, every time you roll an Alien Symbol, you have to choose one alien on the board to advance. With multiple players rolling Action dice, things can go south really fast. When the timer runs out, you can still place any dice you have left over, but you won’t be able to roll them anymore. Luckily, technology has advanced to a degree that we just might stand a fighting chance. We’re able to get our hands on some pretty sweet Weapons and gear that pack a punch. Each Weapon and Item has an activation cost indicated on the card. Some are single use, while others can be tapped into again and again. During the Alien Ability phase, aliens perform the abilities on their profile card. The only saving grace is that we get to choose the order these abilities are executed in. Then, during the Alien Movement phase, those otherworldly monsters get to advance towards the team. To end a round, we check to see if the win or loss conditions have been met. To win, we need to have completed our Objectives, and oh yeah, no one can have been killed by the alien attackers. To lose? Well, that’s simple. If the Objectives aren’t completed by the end of the eighth round, if an alien makes it to the starting space of the map, or if even one team member have been killed, we lose. War (and make no mistake, we’re in one) isn’t pretty. Decisions have to be made quickly. During the Action phase, if an action has been taken, there’s no going back. Mistakes may be made, but you can’t cry over spilled milk. Actions taken are final. Before we start the Action phase, we have to come together as a team and discuss what our goals are for the round. We’re not going to defeat this scum if someone tries to play the hero. Only by working as a unit will we be able to win the mission, complete the Objectives, and live to fight another day. This battle isn’t easy. The odds against us are long. The chances of us getting out are low, but our future hangs in the balance. Winning or losing, living or dying, this is the reality we signed up for. Hell, if anyone can do it, we can. This isn’t Project ADEQUATE, this is Project ELITE. We’re going to send these monsters back to whatever nightmare they came from, or die trying. 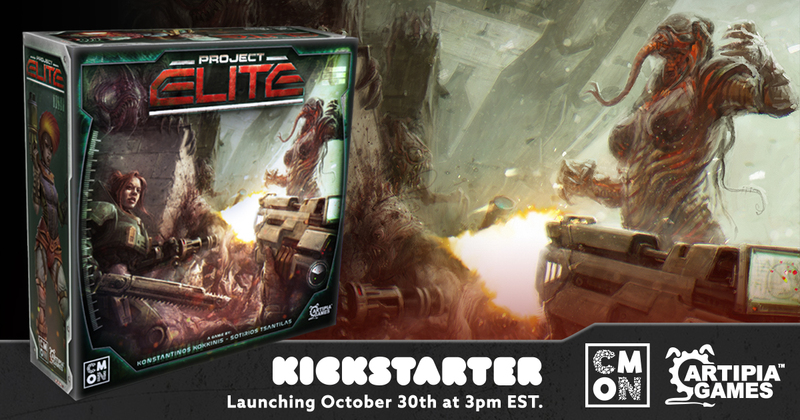 Project ELITE is coming to Kickstarter on October 30 at 3 PM EST. Stay tuned for updates on the CMON Facebook page as the fight win back the Earth approaches.